Core Director: Cheryl Oliva England, B.S. The Chemistry & Biochemistry Core Facility provides technical support for analytical and preparative laboratory procedures, modifies/adapts/ optimizes existing protocols and develops new methodologies as required by the investigators. This support includes protein, lipid and lipoprotein purification and analysis. 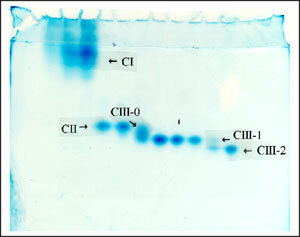 Separation of proteins by 1-dimensional (1D) polyacrylamide gel electrophoresis (PAGE) including native PAGE, SDS, urea and isoelectric focusing (IEF) and 2- dimensional (2D) (IEF in the first dimension and SDS-PAGE in the second dimension) gel electrophoresis. Proteins separated by 2D gel electrophoresis can then be excised from the gels and analyzed by Mass Spectrometry. A variety of formats is available including large gels, minigels tube gels and PhastSystem gels. Fig. 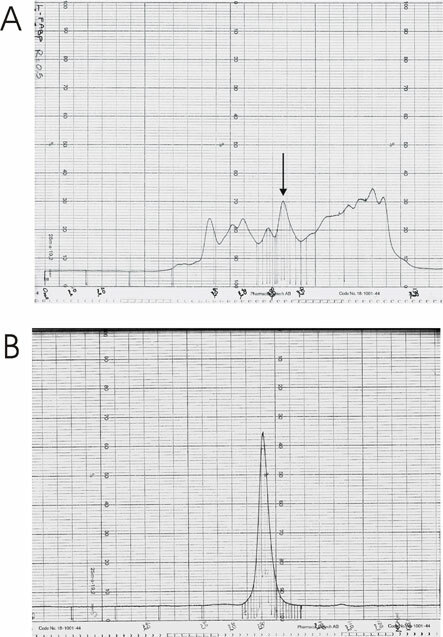 1 Characterization of LDL before and after oxidation by agarose gels. Intact LDL (lanes 2,10) was exposed to copper for 30 min (lanes 3,11), 3 hr (lanes 4,12), 18 hr (lane 6) and 24 hr (lanes 5,13) or heated to 55ºC (lane 14) or 65ºC (lane 15), separated on agarose gels and stained by Coomassie Blue (lanes 1-8) and Sudan Black (lanes 9-16) to visualize proteins and lipids, respectively. Whole plasma (lanes 1,8,9) and HDL (lane 16) were run for comparison. Analysis of proteins by immunological techniques including Western blotting and dot blotting. Fig. 2 Purification of human liver fatty acid binding protein (LFABP) by FPLC.LFABP expressed in insect cells was purified by FPLC using Superdex-75 16/60 (prep grade) column after precipitation of cellular proteins by ammonium sulfate. The fractions containing LFABP (A, see arrow) were pooled and re-applied on the column for final purification (B). Purification of proteins by liquid chromatography including High Performance Liquid Chromatography (HPLC), Fast Protein Liquid Chromatography (FPLC) and Affinity Chromatography, Heparin and immunoaffinity chromatography. Purification of lipoproteins from human plasma by sequential and density gradient ultracentrifugation. Purification of human apolipoproteins from HDL including single isoforms (apoA-I, apoA-II and apoCs). Fig. 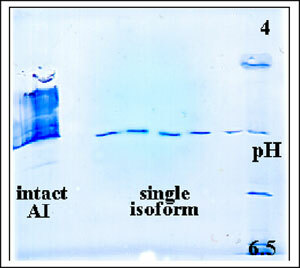 3 Purification of a single isoform of apoA-I. ApoA-I derived from HDL was fractionated on a Mono P HR 5/20 chromatofocusing column in 6M urea with a linear descending pH gradient (6.30-5.35) to resolve the major isoform. The fractions containing the major isoform were resolved on a PhastSystem isoelectric focusing gel (pH 4.0-6.0). Fig. 4 Purification of isoforms of apoCs. apoA-I-poor –apo HDL was chromatographed on a Superdex 75pg Hi-Load 16/60 column in 4M guanidine HCl buffer pH 8.0 to isolate apoA-II and apoCs. The Fractions containing apoCs were resolved by 7M urea gel. Separation and identification of lipids by Thin Layer Chromatography (TLC), Gas Liquid Chromatography (GLC) and HPLC. Purity check of lipids using TLC, GLC, HPLC and FPLC. Quantification of lipids, triacylglycerols, free and esterified cholesterol and phospholipids by enzymatic and chemical techniques.